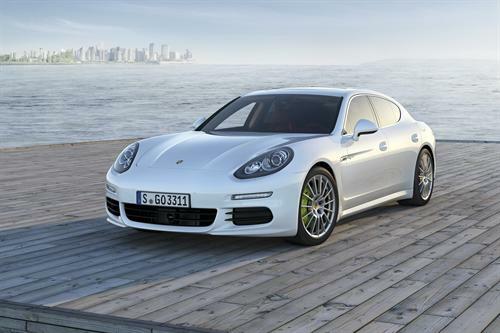 Porsche surprised audiences with the unveiling of a plug-in hybrid version of the Panamera at Auto Shanghai in China. The 2014 Panamera S E-Hybrid joins 8 Panamera models. Will it be available in the U.S. as well? The world premier of the 2014 Porsche Panamera models at 2013 Auto Shanghai was fully expected and official releases from Porsche had already announced as much. So the unveiling was expected to be interesting, but not a surprise. The German automaker stunned the world when it debuted not the 2014 Panamera in all of its expected variations (including a rumored hybrid), but instead debuted a world first for the company: a plug-in hybrid option. The new 2014 Panamera S E-Hybrid will be the fuel-efficient option in the beautiful Panamera lineup of cars. Built specifically for expected high sales in Asia, the car will also become available in other parts of the world. Yes, including North America. It's no marketing ploy to use China as the springboard for the new Panamera. When the car first debuted globally, back in 2009, it debuted in China as a new model in the Porsche lineup designed specifically for the Asian market. Since then, it's become one of their best-selling cars in Asia with one out of every three Panameras going to China. Of course, Porsche would be remiss to ignore its largest market (the U.S.) in favor of its second-largest (China), so all of its 2014 Panamera lineup will also be coming to America, including the new Executive versions. Expected availability in the U.S. is late this year with the exception of the Turbo S and Turbo S Executive models, which will wait until early 2014. Base model price for the 2014 Panamera is $78,100 (plus destination) with the S E-Hybrid at $99,000 and the top-end Turbo Executive at $161,100 - again, destination not included. The 2014 Panamera S E-Hybrid improves on the previous-generation hybrid model with a more powerful electric motor, larger battery with new-generation cells, and plug-in capability. The electric motor is more than twice the output of the previous, at 96 horsepower, and the newly-developed lithium-ion battery pack is 9.4 kWh (2 hours to charge at 240V). All of those advanced electrical components couple to a 3.0-liter twin-turbo V6 engine and automatic transmission. Together, they propel the car from zero to sixty miles per hour in 5.2 seconds and have a top speed of 167 mph. Porsche has not given the all-electric range of the Panamera S E-Hybrid and here are not yet any EPA estimates for fuel efficiency for the new Panamera.